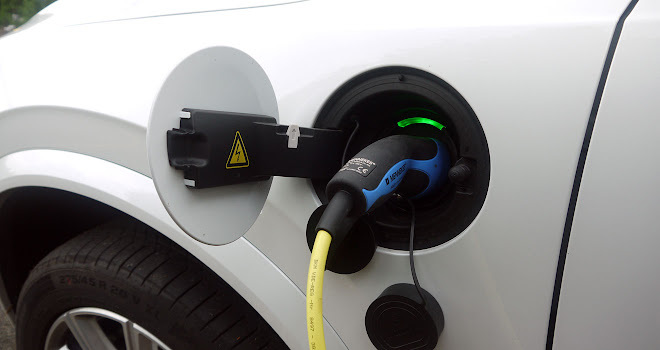 For a brief period after its launch late last year, Volvo’s XC90 T8 Twin Engine qualified for the government’s plug-in car grant. Not anymore. The grant was revised in March and “premium” cars worth £60,000 or more were booted out. Starting at £60,455, the T8 is no longer welcome. If you’re wondering why Volvo doesn’t trim £456 from the price-tag to qualify again, the cost ceiling is applied only after the car is optioned. 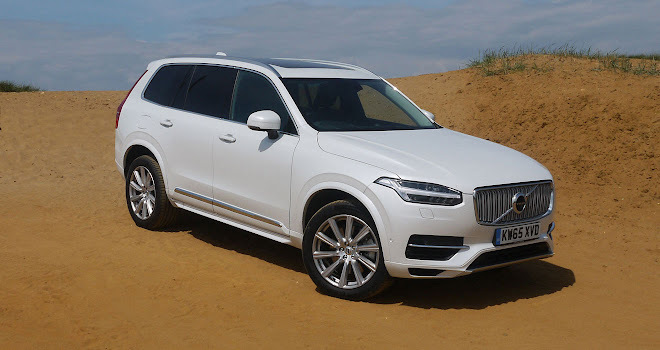 And it’s clearly not in Volvo’s interest to encourage a glut of XC90s kitted out like a hermit’s closet. If it weren’t for the price, the big plug-in Volvo would sail straight into category 2 under the grant’s current rules, which require a CO2 score below 50g/km and between 10 and 69 miles on electric power alone. The T8’s official figures are 49g/km and 29 miles on battery. These numbers comfortably beat the similarly sized plug-in BMW X5 xDrive40e, which flunks even the grant’s category 3 test of 75g/km and 20 miles, albeit only by a pair of whiskers. The Volvo also beats the BMW on company car tax, by a very significant margin, on account of its lower CO2 score. 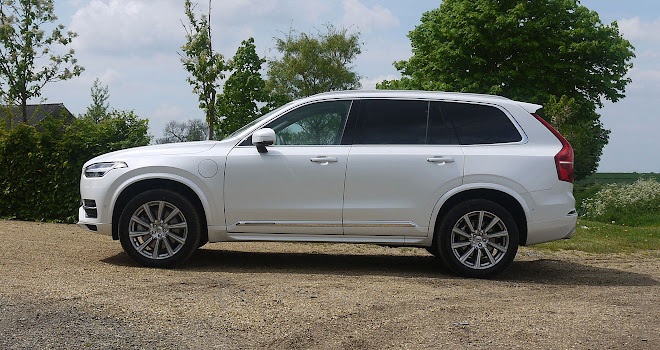 The tax savings are enough to make the T8 pay off over a diesel XC90, for higher-rate user-choosers. Climb aboard the Volvo and you can understand why the government might feel disinclined to hand out any grants. The XC90 is clearly a place of privilege, with a glorious cabin full of leathery luxury made wholesome by Scandinavian restraint. Twinkly, jewel-like switches adorn the centre console and the gearlever is fashioned from hand-crafted crystal, though the result somehow manages to avoid looking gaudy and tasteless. 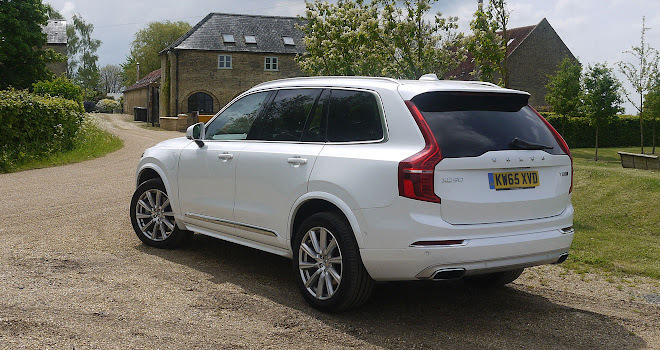 It is, however, quite difficult to feel planet friendly from the driving seat of a plug-in XC90, no matter how carefully you might eke out its EV miles. There’s no escaping that the car is huge and imperious, squashing the earth under its 2.3 tonnes. It feels as wide as a bus, stretches almost 17 feet from nose to tail, and is an inch taller than the average adult male. You might salve your conscience by noting that the XC90 can carry seven people, which is another plus point compared with the plug-in X5. The Volvo’s two rearmost seats fold out of the floor and are generously sized for children, providing plenty of headroom and a good view out via the deep side windows. A pair of adults might even wriggle into the back row for a short ride – meagre space for knees can be eased by sliding sections of the middle-row seating forward a little. The seven seats are enabled by a space-saving layout for the T8’s electrical hardware. The 113kg 9.2kWh lithium-ion battery fits neatly within the car’s central tunnel, meaning it doesn’t encroach into the boot – a big improvement over the earlier plug-in hybrid V60 estate. There is, however, no room for a spare wheel because there’s a box of drive electronics hiding just under the boot floor. 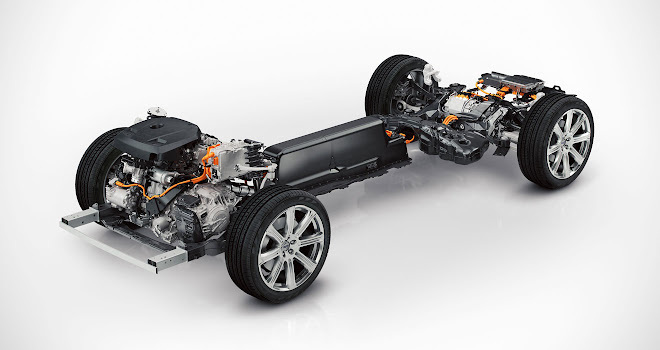 The car’s main 65kW (87bhp) electric motor drives only the back axle, while a 2.0-litre, four-cylinder petrol engine powers the front wheels via an 8-speed automatic transmission. The engine is aided by a second 34kW (46bhp) front-mounted motor, which acts as a starter, generator and electrical boost to the engine. Combined, the two ends of the car can summon 407bhp and 640Nm of torque, enough to haul the barn of a car to 62mph in 5.6 seconds. Indeed it can on occasion feel unnervingly quick for such a big, softly sprung beast. Charging the battery takes up to four hours from a 3-pin socket. 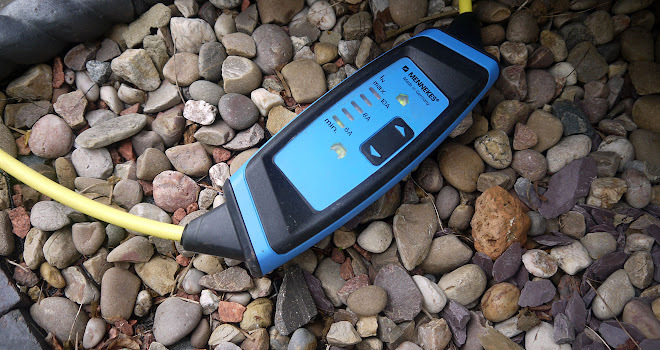 If you’re worried about overstressing creaky household wiring (or need to ignore Volvo’s guidance and use an extension cable) you can dial down the peak current from 10 amps to just 8 or 6 amps via a handy control box built into the mains cable. The charging time will stretch accordingly, of course, but I tried a 6-amp charge and it worked without a hitch. A better bet is to install a wallbox that will pump in 16 amps and reanimate the battery in only 2.5 hours. On the move, the car’s size and heft are ever present, though it helps that smaller cars are often scared out of the way. Noise levels are generally low, and of course there’s never a shudder of the vibration you might suffer from a diesel. Cruising on the motorway is a peaceful affair. The supercharged and turbocharged engine can contribute a bit of rasp when pressed, and even at slower speeds you will always know whether the engine is running or not. Its contribution usually feels seamless but isn’t always so. The car will sometimes lurch forward a little as traction switches from electric to hybrid running, especially at lower speeds. Stabbing the throttle to overtake a slower vehicle does produce a satisfying shove in the back. Slowing down again is not quite so impressive – you need to give the brake pedal quite a firm stomp to stop smartly. This is presumably to encourage the more gentle braking that is best for energy recovery, using the two motors as regenerative brakes. There’s also a B setting at the gearstick, which increases regeneration when running downhill. A demand dial at the right of the digital instrument cluster provides a handy guide to what’s going on. The virtual needle swings upwards to show how much of the car’s potential you are using, or down to indicate battery regeneration. Handily, the dial is marked by an indicator that moves around to show when the petrol engine will ignite, helping you to moderate the throttle and stay in electric mode for longer if you want. The ignition point varies according to speed, how much charge is in the battery, and which driving mode you’re currently in. The default driving mode, always set on startup, is Hybrid, which uses both battery and petrol power to maximise fuel efficiency. There’s also a Pure setting, which runs the car on electricity alone for as long as it lasts, and a Save mode to preserve battery power for later. Then there’s a Power setting which throws the kitchen sink at going faster, even burning extra petrol from time to time to top up the battery, ensuring full power is available at the back axle. Similarly, there are two 4x4 settings – AWD for traction on slippery surfaces and an Off-Road option for rougher ground. In both these modes, the front generator running off the engine can be relied upon to send continuous power to the rear motor, ensuring that the back axle doesn’t run out of steam even if the mains battery charge has been depleted. Your chosen driving mode is selected by twirling a delightful little knurled roller, which brings up options on the central touchscreen. This nine-inch display works much like an iPad, responding promptly to swipes, pinches and prods. Well, I say promptly – what I mean is after the car has booted up. 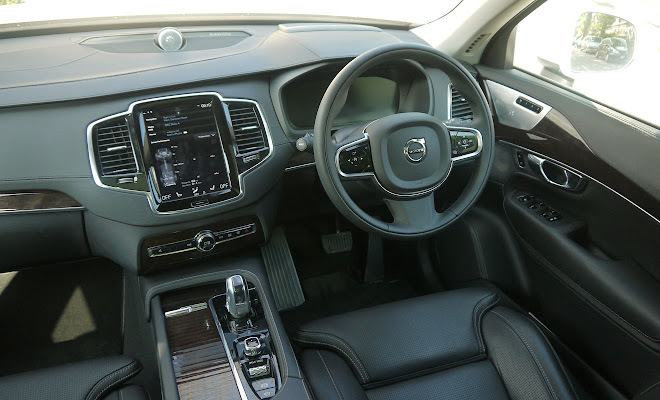 When you first climb aboard and switch on, it takes a fair while for the XC90’s digital system to finish loading. If you want to set off in Pure mode, for example, you have to drum your fingers for 30 seconds while the car gets all its pixels in a row. This gripe aside, the digital interface works very well, and the large portrait screen is a boon when you need to consult the map. You can also call up a screen to see how you’re doing in fuel economy terms, and what percentage of the journey has been done without the engine running. Pairing an iPhone went without a hitch, and making or answering calls mid-journey proved trivially simple. There are a bewildering array of settings to tweak via the screen. Want just the nearside mirror to dip and show the kerb when reversing? There’s a checkbox for that, among about a hundred others. Not all of the software is fully baked. I couldn’t find an onscreen button to cancel navigation (though there is one to pause it) and so directions to a place I no longer wanted to visit resumed every time I started the car. I turned to the voice interface to try to clear the route, and quickly wished I hadn’t. First, you have to use the right phrase – “clear itinerary”, obviously – and then confirm with a “yes”. After having bellowed that simple short word at increasing volume three times, I finally got the required cancellation. Apple’s Siri it is not. 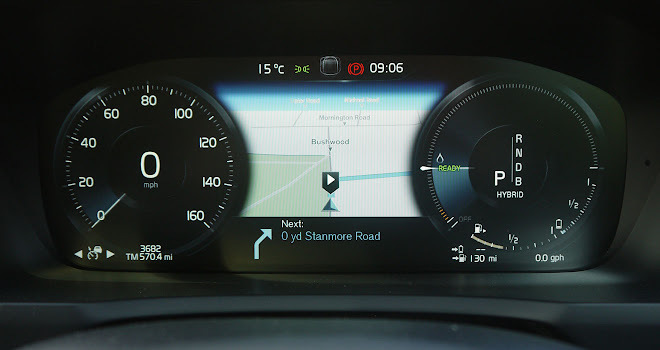 More pleasing is the bright and legible head-up display, though at £1,000 for the option it ought to be pleasing. 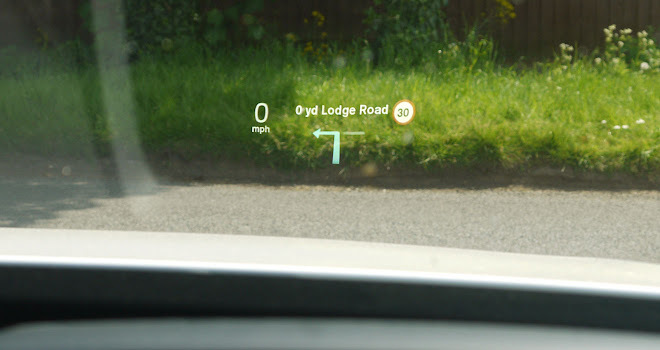 It paints current speed and navigation directions directly onto the windscreen, along with a roadsign roundel for the current speed limit. The roundel helpfully blinks in your peripheral vision as you surpass the speed limit. There is also a checkbox to stop you exceeding the limit at all, should your licence be teetering in tatters. Again, if you’ve checked the right boxes, the HUD will show an orange warning whenever you stray too close to the car in front, followed by a big splash of warning and a loud klaxon if the Volvo thinks you’re about to hit something. I know this because at one point, as I nipped inside a car waiting to turn right, I got the full red flag and pretty much jumped out of my skin. Most of the time, the various safety and assistance systems operate as intended. 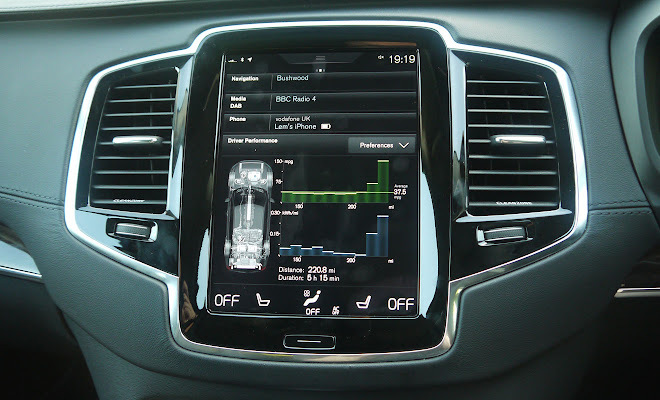 The adaptive cruise control, for example, worked seamlessly throughout. The gap to the car ahead can be easily adjusted via buttons on the wheel. I put the cruise control to use during a run up from East London to the north Norfolk coast, 105 miles away. This was also a great opportunity to gauge fuel economy in the absence of charging points, which are scarce in Norfolk and non-existent at the beach. I used hybrid mode to get to the M11, then saved battery power all the way to the seaside. While there I did 4 miles of EV pottering and a timid bit of 4x4 action in the sand, before switching back into Save mode for the return leg to London, via King’s Lynn and Cambridge. People familiar with west Norfolk roads will know that dual carriageways haven’t been invented there yet, but there are plenty of tractors on the lumpy, off-cambered roads and ample opportunities for white-knuckle overtaking. I also faffed about a bit at three different points taking photos, moving the car around to get the light just right, as you do. Arriving back in London, using the last of the battery’s reserves over the final few miles, I’d averaged 37.5 mpg over 220 miles. With only one battery charge right at the start of the day, I’d score that as much better than expected. 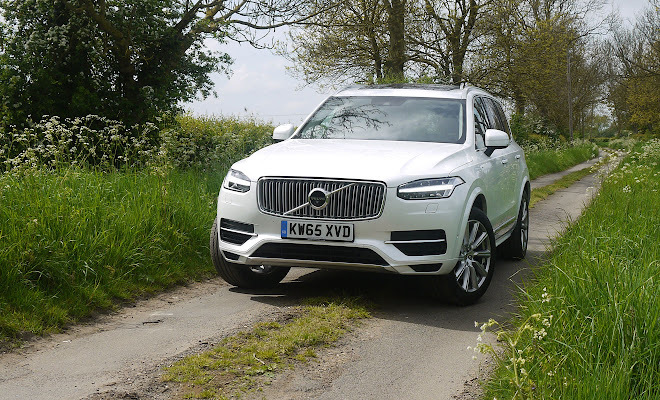 I suppose that verdict is not a bad summary for the XC90 T8 as a whole. I came to the car as something of a sceptic, thinking it too big and brutish. I came away feeling almost persuaded. It is too wide, and far too heavy, but it’s not remotely brutish. If you can afford one – and you’ll have to manage without the plug-in car grant’s helping hand – it’s a car you could very easily fall for.